Distribution These snakes come from central Australia. Size The average size of a Bredl's Python is 153 - 183cm (5 - 6 feet). Diet Their main diet consists of pink mice and fuzzies for hatchlings. An average sized adult will eat 2 - 3 medium rats every 7 - 10 days. Juveniles will eat 2 - 3 fuzzie mice per week. Pythons should be fed in a separate feeding container, this will help to condition your snake not to expect food in its vivarium and also to prevent it from ingesting any substrate. Requirements Heat Source: This can be either reflector (spot) lights in green, blue or red. Ceramic or tubular heaters can also be used, although thermostatically controlled heat mats can also be used. Ultra Violet Light Source: Although there is a lot of controversy regarding the use of UV supplementation with snakes, many herpetologists wouldn't be without one. 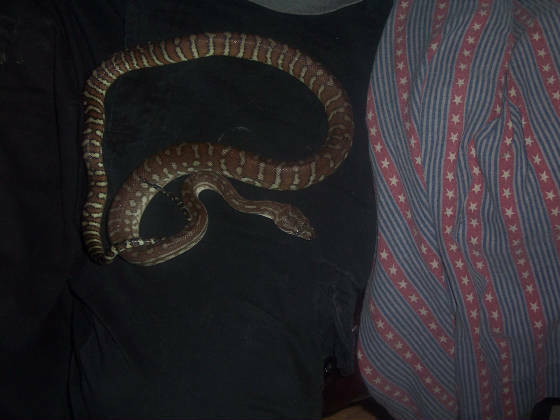 It has therefore been included in this care sheet as a suggestion and the recommended type for snakes until further scientific research proves otherwise is a 2.0% UV light, which should be left on for 8 - 12 hours a day and replaced every 6 months unless otherwise stated by the manufacturer. If you decide to use a UV with your snake, care should be taken if your snake is albino as the light intensity could have detrimental effects on the eyes of your snake. Vitamin D3 supplements should also be kept to a minimum. UV light is often recommended by Australian breeders of this species. Thermostat:An essential part of every vivarium and is required to control the heat inside the vivarium and to prevent your pet from becoming too hot or too cold. Housing: This should consist of a dark wooden vivarium with glass frontage and adequate ventilation. Hatchlings would require a small hatchling tub (pen pal, geoflat or even a ventilated sandwich box) which can be housed in a heated vivarium. A pair of adult snakes can be housed quite happily within a vivarium measuring 180cm long by 120cm high by 120cm wide (6ft x 4ft x 4ft). Bredl's pythons are mainly semi-arboreal, so logs should be securely fitted for them to perch on. Wire Mesh Guards: These should be fitted over all heat sources used in order to prevent any thermal burns from occurring. Thermometers: One should be placed at either end of the vivarium. Never go by the temperature on the thermostat as this is often incorrect. Hides: A large hollow log (or any other large hide) is best mounted around 15 - 20cm (6 - 8 inches) off the floor, due to the arboreal nature of this species. Water: These animals require a water container which will allow them to bathe without constriction. This water should be changed daily as this is also the water they drink. Temperature A background temperature of 29 - 30°C (84 - 86°F) is required. A basking area covering one third of the vivarium should be allowed to reach temperatures of 31.5 - 33°C (88 - 90°F). At night the temperature may be allowed to drop to 27°C (80°F), although this is not recommended if your snake is suffering from any respiratory infections. Longevity These snakes have been known to reach ages of around 10 years, although they can live for longer in captivity. Substrate This can be anything from newspaper, brown paper or even astro turf. Whatever you use remember that it must be cleaned on a regular basis to prevent contamination from disease.